Getting Oxygen: What do you do if you’re cell twenty-two? Living things need oxygen. Whether you are an elephant, an oak tree, a fish, or an insect, every one of your cells must be supplied with oxygen. If your entire body consisted of a single cell, you would have no trouble getting enough oxygen. It could move easily into your body from the surrounding air or water. But imagine you are a cell in a ball-shaped animal with twenty-two cells. Imagine you are cell twenty-two, completely surrounded by other cells. How do you get the oxygen you need to survive? 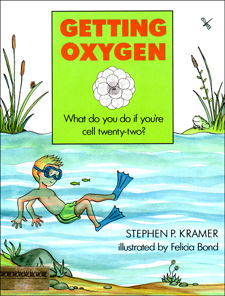 Clear, entertaining, and scientifically accurate, Stephen Kramer’s first book for children explains how various animals and plants go about getting oxygen to all of their cell twenty-twos.